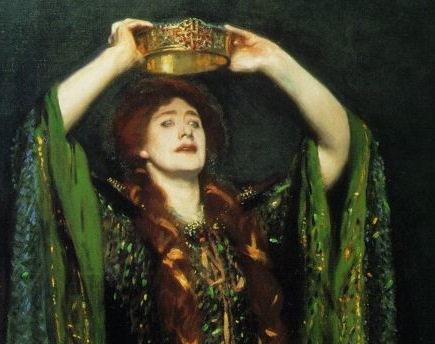 Picture taken from http://transmedialshakespeare.files.wordpress.com/2011/03/lady_macbeth.jpg. Image depicts Lady Macbeth, also known as Gruoch, the main character of this story. A short story written for an English class project. Part historical fiction and part fanfiction, it is based on William Shakespeare's Macbeth. Posted to the Teen Ink website on March 17, 2012. The estate of Inverness was cold and dark, especially in the wintertime when shadows would swallow what little light shone through the castle windows and blustery winds and falling snow would beat against the stone walls, howling to be let in. The only source of natural warmth came from the hearth, and it was there that Gruoch found herself, kneeling on the floor and staring into the flames. She was aware that this was not the customary tradition for funerary arrangements, especially one such as this, but she had little patience for tradition and had a mind to do this on her own terms. She had requested not to be disturbed for an hour. Most of the hour had already been spent watching the flames and turning over the circumstances of the child's death in her mind. Illness. It had been going on for months. To be expected in this season. Nothing to be done. She looked down at the bundle cradled in her arms and thought about the color red. Red was the color of lips and apples and berries. It was the color of her hair—her greatest beauty, or so all the men said—and it was roughly the color of the drops of blood that stained her palms. It wasn't the first time she'd had blood on her hands and it certainly wouldn't be the last. She would have liked to wash it off, just so the servants wouldn't stare—not that they'd dare to ask, anyway—and so she wouldn't have to keep looking at it, but there were more pressing matters to attend to at the moment. It could wait for another few minutes or so. 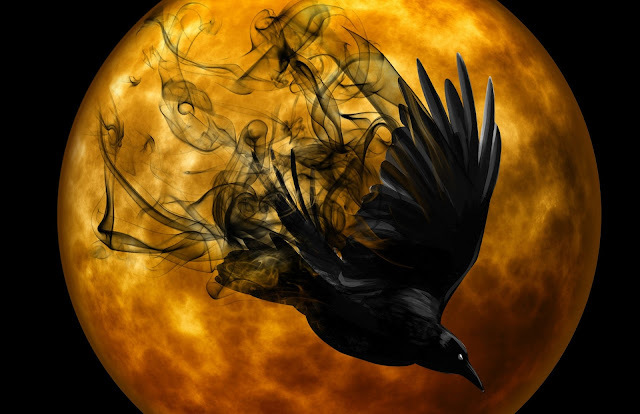 She rose to her feet and lifted her arms a little bit higher, staring at the fire once again, from above this time. She wasn't quite sure if she should say anything. A final goodbye? A belated lullaby? Certainly not a prayer to a god she'd never believed in. She settled on silence and dropped the bundle into the fireplace. She found herself somewhat relieved to be free of its weight as she watched it burn. So they would dare to ask, then. Interesting. Gruoch turned to face the servant and met her eyes. “It died.” There was no expression in her voice or on her face, nothing except unnaturally cold tranquility and the regal bearing with which the lady always carried herself. Calm, calculating, unaffected. Gruoch herself would probably say indomitable. “Has Lord Macbeth sent word of his return yet?” asked the lady. It was a pointless question that she already knew the answer to, but she asked it anyway in the interest of filling the silence. The servant backed out of the room and started down the corridor, only allowing herself one glance back toward her mistress. Something dangerous and terrifying was going to happen, she could feel it. Matters could only get worse from this point on. And when they did, no one was going to be safe. Especially not Lady Macbeth. Perhaps a catastrophe could be prevented. Perhaps not. Only time would tell.